The crisis currently affecting the Lake Chad Basin countries is a result of conflict with Non-State Armed Groups and has triggered significant displacement of populations. 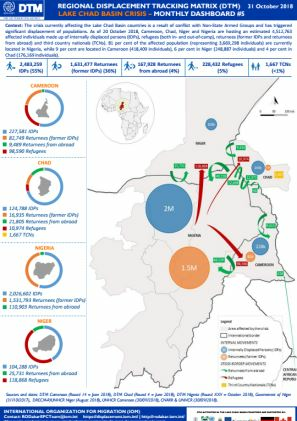 As of 20 October 2018, Cameroon, Chad, Niger and Nigeria are hosting an estimated 4,512,763 affected individuals made up of internally displaced persons (IDPs), refugees (both in- and out-of-camp), returnees (former IDPs and returnees from abroad) and third country nationals (TCNs). 81 per cent of the affected population (representing 3,669,298 individuals) are currently located in Nigeria, while 9 per cent are located in Cameroon (418,409 individuals), 6 per cent in Niger (248,887 individuals) and 4 per cent in Chad (176,169 individuals).